The prosperity of Saint-Malo date of the XV and XVI centuries, when the decline begins in Saint-Servan. Under Louis XIV's wars, the maritime adventure of Saint-Malo takes off. War enriches privateers, the catch is divided equally between the King, the owner and crew. At the same time, the shipping trade is growing: in addition to the traffic of the India Company there is the trade with the Netherlands (Delft), Italy (marble), Chile and Peru (precious metals), Spain (leather), not forgetting the triangular trade Africa - Caribbean - Europe (slave trade). The architecture is also being developed under the influence of Garangeau and techniques of shipbuilding. 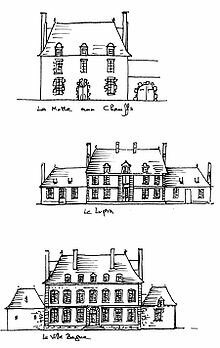 The architecture of the 1710s is very much representative of the brand of Engineers King (Garangeau disciple of Vauban and his team). This gives the city of Saint-Malo unity and classic majesty, but also almost military austerity. The use of granite from Chausey was systematic. The roofs and the chimneys are very high. Until the seventeenth century, the openings are drilled as required. In the eighteenth century, they are symmetrical and aligned (military architecture). Traders recover the investment by renting apartments. Some even build real hotels with courtyards, gardens, stables, shops, so Guillaume Eon in Saint Vincent street or François-Auguste Magon de la Lande in Asfeld street. Until the early eighteenth century, the citizens rearranged the traditional farm they had bought or small manors (Limoëlou, The Park, The Sewing). These residences are multiplied throughout the territory of Clos Poulet, then spread westward and southward to Dinard (Manor of Haux, Montmarin, St Busq). Of land was reclaimed from the sea, allowing the urban development of St Malo. It was around 1710 that is truly born a new type of second homes that can now be designated by the term "malouinière" (la Giclais, le Lupin, la Chipaudière, la Balue, le Bosc, Asfeld Hotel). Garangeau style is very clear. Most of the malouinières were built between 1680 and 1730, within twelve miles of St Malo, by shipowners wishing to escape the stuffy world of the city (20000 inhabitants in 1750 to 2500 today) while still close (two hours on horseback) to care for their vessels and their cargoes. They are located inside the "Clos Poulet" (Clos Poulet means Aleth country) from the name of Gallo-Roman camp of the citadel of St. Servan, the starting point to Cornwall where tin was charged. These properties were surrounded by several acres of land, allowing the field to be expande. There are dozens of malouinières near Saint-Malo and across the Rance country.